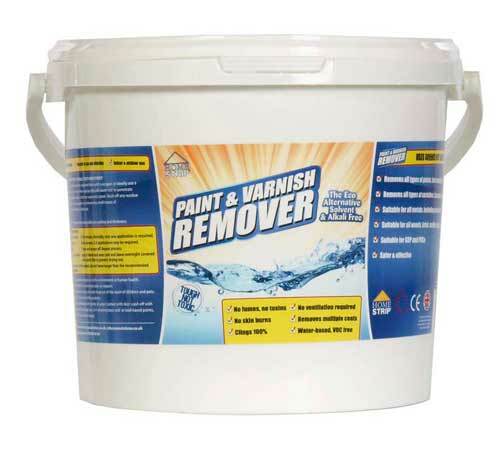 Eco Solutions, A UK company have invented a really powerful paint and varnish stripper which does not contain any solvents at all! Their entire range of products from De-Greasers, Artex removers, and even general purpose cleaners are all solvent free and the company uses the strap-line "Science not Solvents" to get the message across. This really is World Leading technology so we set out to see if it is as good as it claims to be.....And it was! Home Strip is safe. It is solvent free and will not harm your skin or other parts of your body. Care should be taken of course, but Home Strip is water based and can be washed off, and away, very easily with no detrimental effects. For a really scary alternative read on…………………. (Nitromors shows…….) Limited evidence of a carcinogenic effect. Harmful by inhalation, in contact with skin and if swallowed. Harmful: possible risk of irreversible effects through inhalation, in contact with skin and if swallowed. Product will cause irritation or pain due to strong defatting action on skin. Will irritate eyes. None of this applies to Home Strip, a water-based, non toxic, solvent free paint stripper which will not harm you in any way. We applied Home Strip to a small section of painted matchboard taken from a renovation project which had been painted at least 4 times! The Home Strip was laid on quite thick to allow maximum penetration and to see if we could get all 4 coats off in one go. The video shows this process in action. Using Home Strip in this way you can expect to strip about 4 square metres with 1 litre. Leave the Home Strip on the surface for about 40 minutes and then test a small area to see if the paint is ready to come off. The scraper you use should simply slide under the paint or varnish and a little elbow grease may be needed. The video shows an extensive test where we tried to remove 4 coats of paint in one go but by applying a little less Home Strip and being a bit more patient, you can remove the 4 coats in two attempts. Home strip works well with lead based paints as it binds all the lead pigments in the mulch which results in a liberal coating. If the paint does contain lead, please dispose of it carefully. Home Strip can be used safely on all the following surfaces. Removing Lead based paints has been a problem for years. Not any longer. The lead pigments are kept stable in Home Strip and along with other paints and varnish, is stripped easily from the surface with no damage done to the surface. This really is an excellent product and we are very pleased to be able to sell it. Well worth the 5-stars we’re happy to award it.